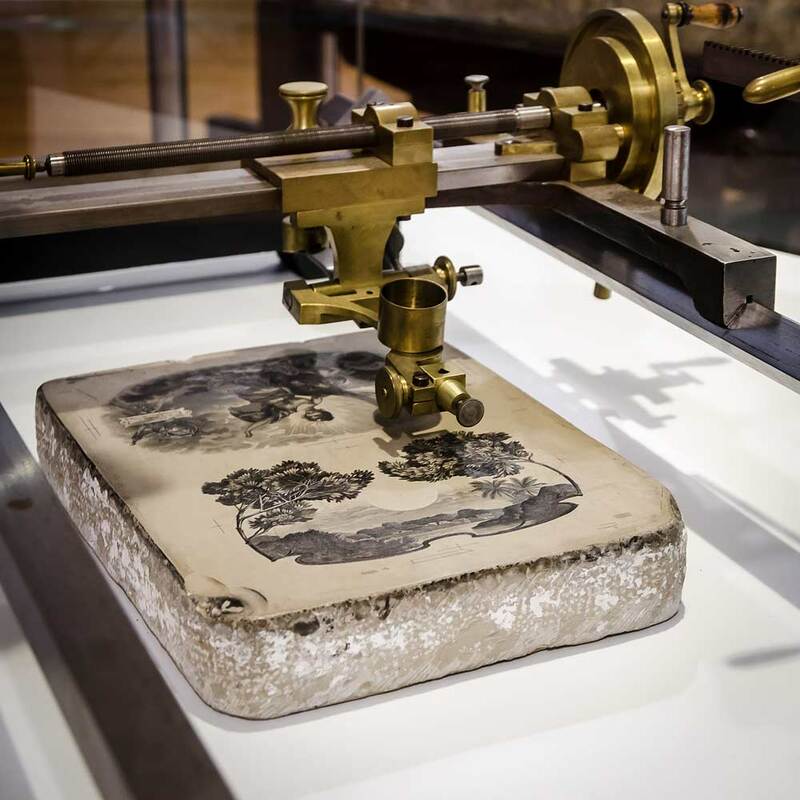 The stoneprinting museum close to Eindhoven in The Netherlands is dedicated to lithography, the printing process invented by Alois Senefelder in 1796. It is a cozy museum with a static collection as well as a press room where stone printing demonstrations take place. The schedule for those is available on the website of the museum of lithography . Obviously there are a lot of lithographic stones to be admired in the main hall. A selection of tools to prepare the limestones for printing is also on display. Before photographic tools became available a lithographer would spend many hours on the artwork of a single page. 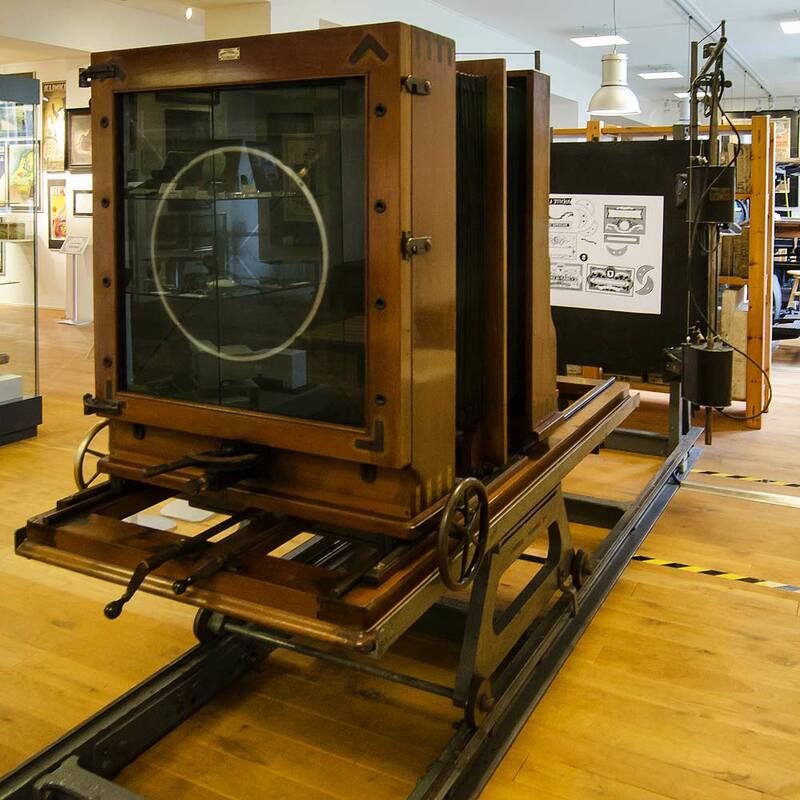 The oldest press in the museum is this wooden ‘Brisset’ press, built around 1880. It is a manual press that was commonly used by French lithographers. 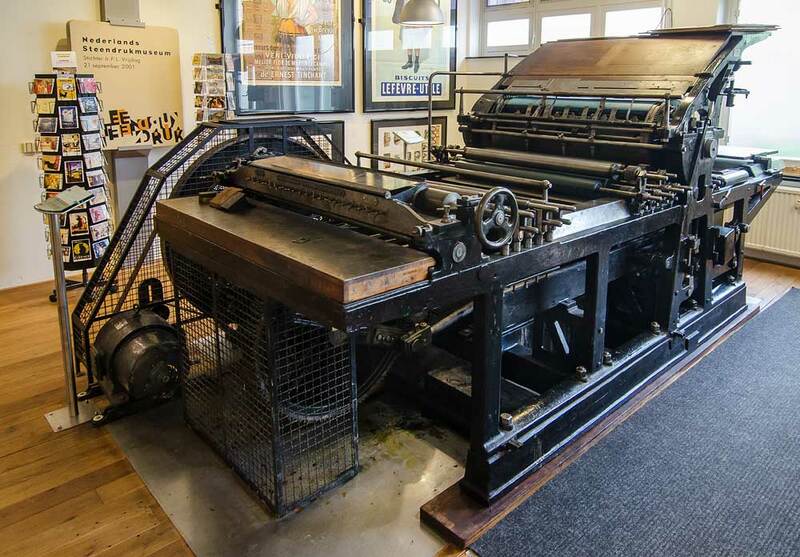 This 1926 German ‘Komet’ press can print 70 by 100 centimeter sheets, making it an 8-up press by today’s standards. It was operated by 3 people, one operator to feed sheets into the press, another to remove and stack the printed sheets and a press man to control the process. The team could print around 900 sheets per hour. 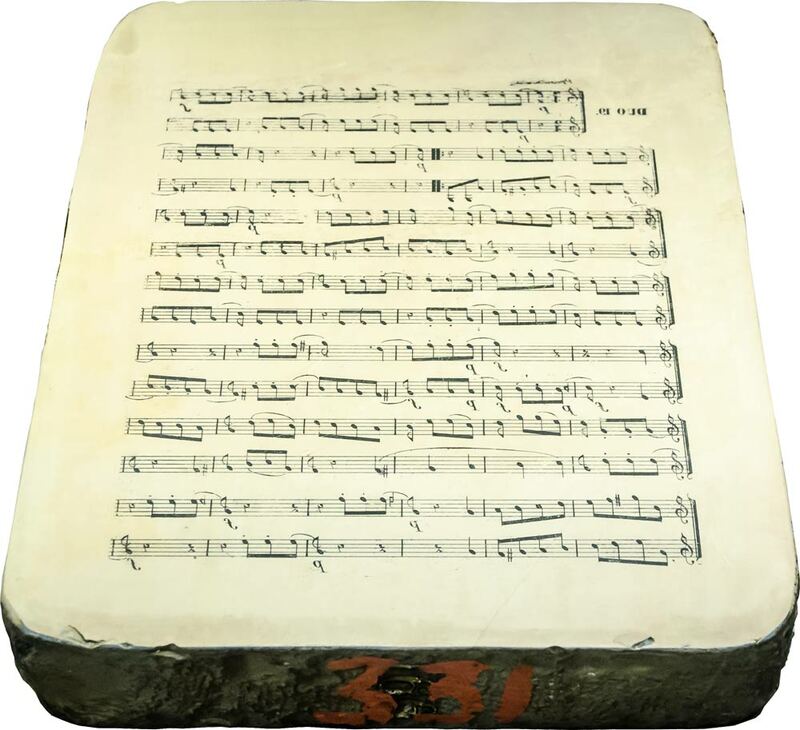 At the back of the press the lithographic stone that carries the image can be seen. The blue roll is not an offset blanket, since this is not an offset press. 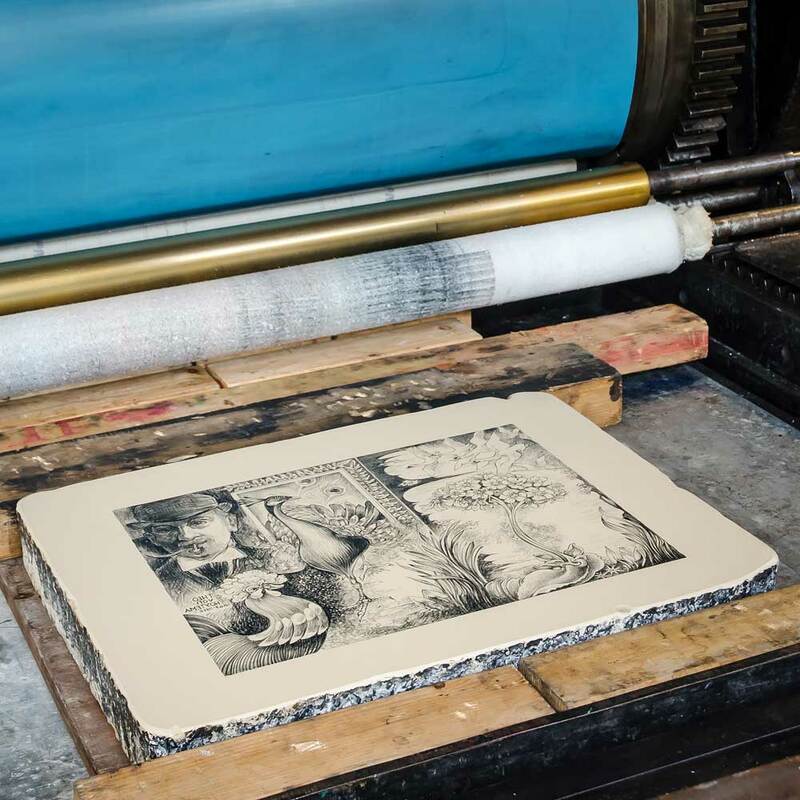 Offset lithography had already been invented when this press was built but it was not yet in widespread use. 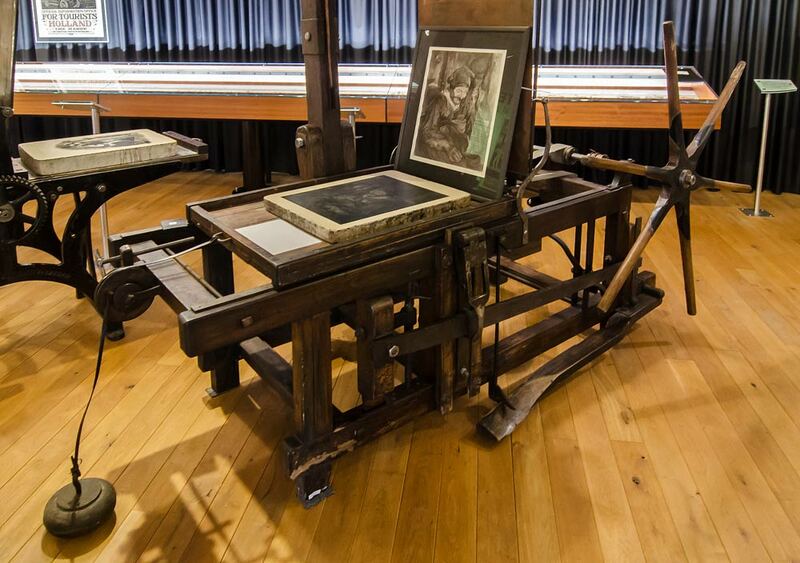 For a long time this press was used to print lithos created by Dutch artists. For color printing multiple stones were used, one per color. 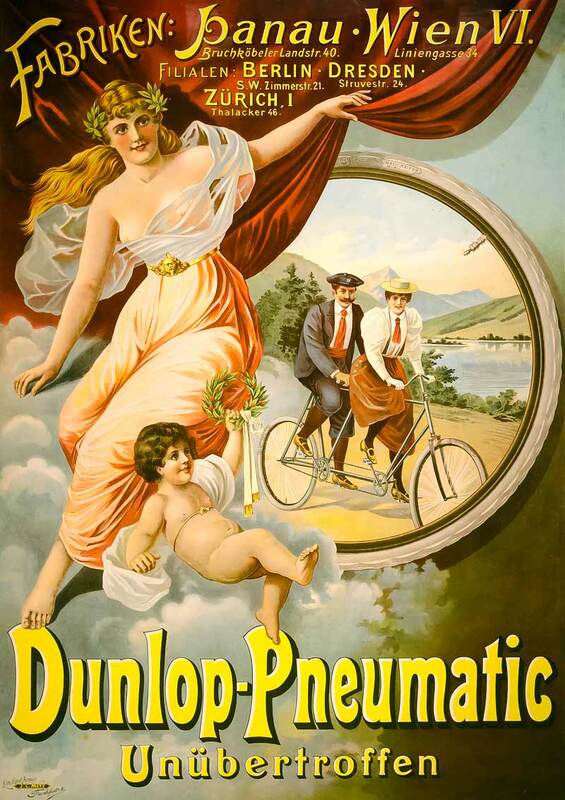 Below is an example of a poster printed in 4 colors. The museum also has an example of an image printed with 8 colors, a tedious task that required a lot of experience and precision. Using this Hunter-Penrose repro camera from 1948 the image of a photograph or artwork could be converted to a negative that could then be transferred to a lithographic stone or printing plate. At the far end, you see the original mounted vertically on a contact frame. It is illuminated using arc lights. By moving the camera and optical system back and forth the correct magnification and focus can be achieved. The negative is then mounted vertically in the camera and exposed. The entire process takes about 5 minutes. Next to the various machines and tools the museum also runs temporary exhibitions. During my visit this consisted of a series of lithographic prints that all had to do with transport. Below are two of the posters that caught my eye. 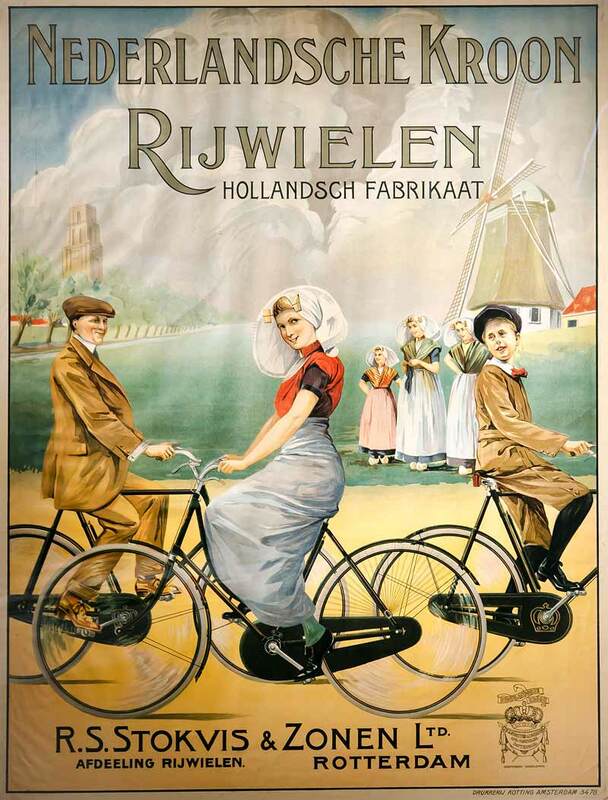 In Holland it is, of course, more or less mandatory to also include some bike-related artwork. There are more presses and a lot more artwork to be seen but this page is just meant to give you a first impression. 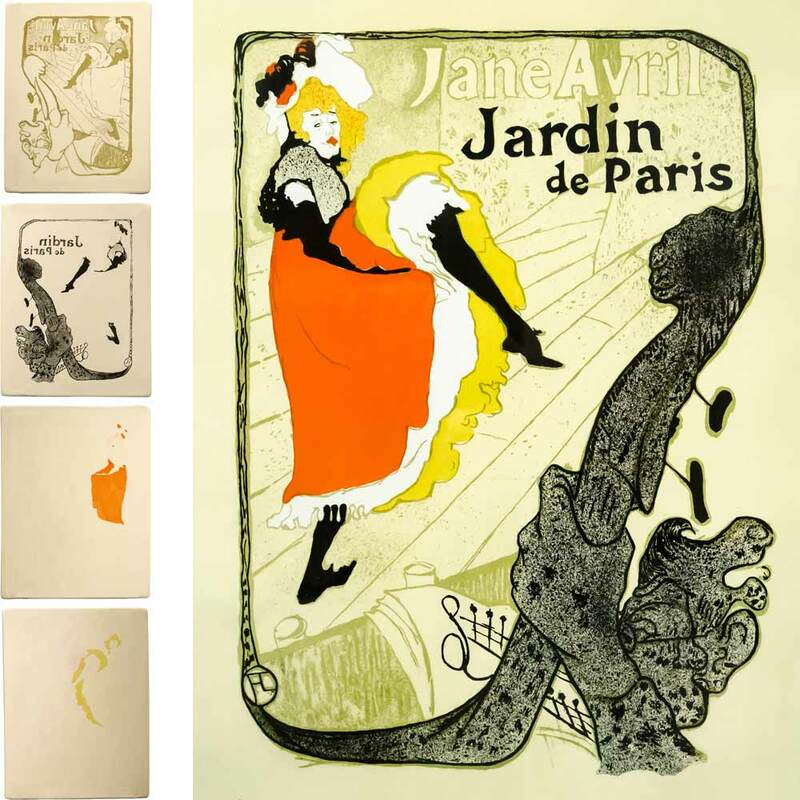 You’ll have to visit the museum yourself to admire their collection of oleographs and other prints or learn how lithography made modern computer technology possible. If you’re interested in old printing equipment, check out my other pages with pictures of printing museums.